The US retail FX industry has maintained a tight consolidation in June, skewed slightly negatively despite volatility. Retail trading volumes have been largely mixed in 2017, with figures being on the upswing over the past few months. However, retail forex deposits in the US have been largely flat or skewed slightly negative during June. Volatility during the month was markedly higher, though this was unable to translate into substantiated gains in deposits. Three fourths of retail brokerages in the US reported losses of forex obligations for the period ending June 30 – the total amount of retail forex obligations reached $530.9 million during the month, which corresponded to a decline of 0.54 percent month-over-month from May 2017. Looking closer at the latest tranche of CFTC data, total futures commission merchants’ (FCM) funds were all negative at all reporting brokerages in the industry with the exception of Interactive Brokers. For Interactive Brokers, June proved to be a positive month, as it notched a tepid gain of 0.31 percent month-over-month. No brokerage was able to register any movement in forex obligations exceeding one percent, attesting to the flat nature of the market as the industry heads into the quietest months of the trading calendar. Looking at the market share of different brokers, the distribution has remained broadly unchanged in June relative to the month prior. GAIN Capital has remained the uncontested leader in terms of market share, commanding a 49.0 percent share. 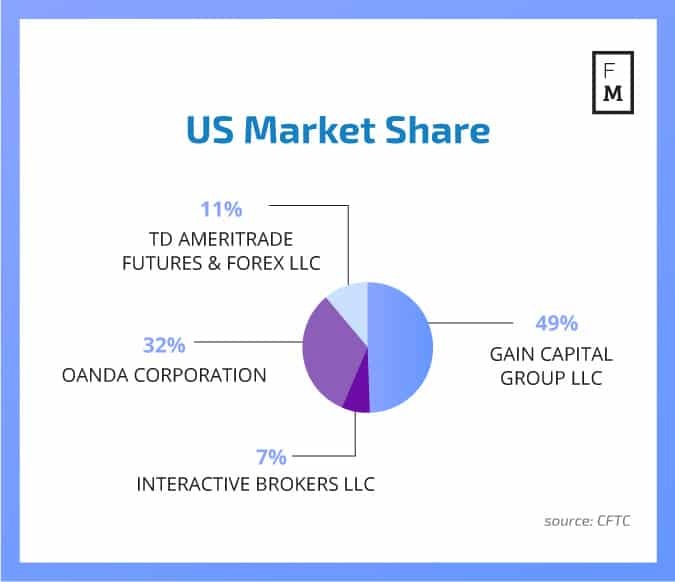 OANDA has also solidified its stance as the second largest in the US with 32.0 percent market share – TD Ameritrade and Interactive Brokers retain a 11.0 and 7.0 percent share respectively.